I generally hate these how much is a litre of milk questions, I rarely look at the price of anything because well if you need it you buy it why clog your head with nonsense, but given the song and dance she makes with all thing Maori her not knowing something that basic shows her up to be a total flake. She is an incredible communicator, has a winning smile is a practitioner par excellence of the dark arts of spin and politics but is a complete lightweight on pretty much all subjects. But we knew that with 9 years in opposition where she pretty much did nothing except look earnest or smiley depending on the circumstances. I haven’t memorised any of Dickens’ novels, but could give a fair precis of them. Not many people would want to hear it verbatim. but a “Section One says A, B, C, D'” would do. To be fair this Labour NZF coalirtion is doing well. Looking forward to another 11 years of this great Government. When Presidential Candidate Rick Perry was asked which government agency he wanted to get rid of, he stumbled. That ended his campaign. The Labour party wants to entrench the TOW in everything but asking them what the three clauses are “gotchya or unreasonable”? The treaty is not 900 pages long but not much more than three long sentences. If we have such low standards of our politicians, what can we hope for? I have to admit that I found it a little entertaining to see her reaction to the question. Rather than make her look foolish though, it may well have helped her appear to have more in common with your average Kiwi, who neither knows nor cares what is contained in any of the articles. What I thought was very disappointing, was her piss poor pronunciation of Te Reo. 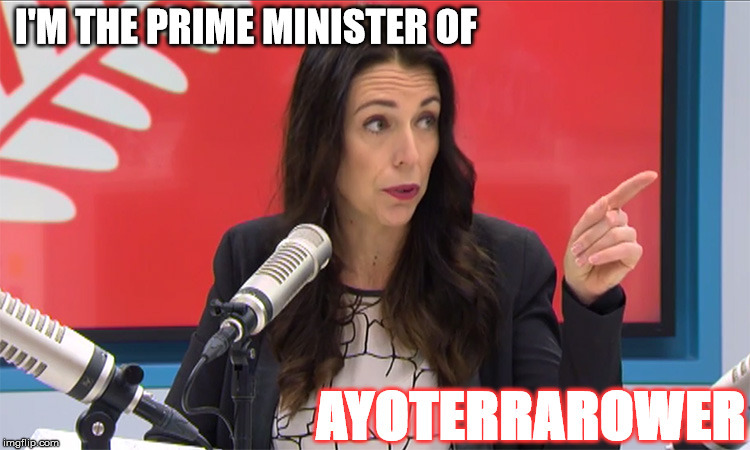 As her pronunciation of English is pretty bad – she has learned an awfully lazy dialect that’s never been corrected & among other things includes routinely replacing Ts with Ds – you could hardly expect her to have pristine pronunciation of Te Reo too. But actually I thought detected some improvement in her Maori pronunciation this Waitangi Day tour period compared to last years. She said tay for te several times in vids I saw, for example; last year, her te’s were all teas. The average Kiwi isn’t PM.It made her look silly and hypocritical. It would be like the UK PM not knowing what the Magna Carta said. How do we know they do? It’s guesswork; it would be all but impossible to know who knows the Treaty in detail. Nobody knows, nor cares, about the specific details of the treaty/te tiriti, other than those who have a vested interest in the grievance industry. Most people who chose to call NZ their home, would far rather deal with the real problems that they face everyday, such as paying the rent/mortgage, feeding theirselves & their offspring, and paying the ever increasing burden of tax that they allegedly owe. George Bush had a standard answer….’pass’! I would guess Bush would know the amendments to the constitution, when the treaty is our founding document you would think the person running the country would know it especially as there are only 3 of them. I would guess that Ardern knows and understands the Treaty articles well. Not being able to recite them word for word on the spot with a lot of things going on means little. Not sure I share your confidence PG, remembering 3 things when you spent 4 days there last year and the same this year probably indicates she wasnt really concentrating when listening to the speeches. Prime Ministers have to read and listen to a lot of stuff. Being able to recite things verbatim is not necessary to be able to do a good job. Even if Ardern could recite the Treaty you would find some other nit to pick. The fact that Bush maybe be able to recite the Ammendments to the Constitution and Ardern not be able to recite the Treaty Articles is more a reflection on ourselves and the lack of value it has to the average New Zealanders life. I have more knowledge of the US constitution than I do of the Treaty. Ardern was caught unprepared. She is likely to have learned from that. Frankly,PG I doubt that, as she seems to be caught out on a regular basis. I think that being caught out on not being able to give specifics about what the Government is going to do, as opposed to the vague rhetoric of what it aspires to do is largely a different matter. Lack of action is this Government’s biggest problem. HDPA is being ludicrous. We’ve been arguing over the Treaty on this blog for as long as I’ve been posting here & I’ll bet none of us could recite eirher an English or Maori version of it without googling it first. She is often unable to respond on specifics re policy as when Twyford, Jones and Robertson changed aspects of KiwiNuild policy, her regime’s flagship policy. She doen’t do specifics in her vague rhetoric it is all waffle and platitude. None of whcih mean anything if she cannot put flesh on the skeleton of aspiration. ‘brain fade’,’haven’t been briefed on that’,’what I can say;’…guess who? I would expect the PM to know the main points, if nothing else. This is certainly one such. Why are we bothering to discuss it? Mistakes aren’t just opportunities in disguise but they’re a fundamental tool of learning right from our earliest days. There are countless situations as kids where we try something & find out from the negative result what the better one is. I remember her getting caught out not knowing answers to some basic stock standard economic questions (or something) on the campaign trail. She had those figures the next day. Thanks Mr Robertson or Mr Parker. She might not be particularly bright (& I don’t think she is) but she’s not completely stupid. I hear that in USA, kids recite a ‘constitution speech’ at school (daily ?) I dont think this is ‘the kiwi way’ BUT when I was at H-S, we learned more about English history, (kings/queens etc.) than NZ ! btw: I bet Jacinda has at least as much knowledge, on this issue as many others do ?! That’s their new role as the post-modern ‘Fifth Column Estate’ … or is it ‘Fifth Estate Column’? Blazer, when the Oprah team went out and asked young people to recite the speech…hardly any could. It’s easy enough to do it in unison with a lot of others. We learned both kinds of history at ‘H S’. Pete, The headline was misleading. I doubt if HDA thinks that the PM should be able to recite the Treaty word for word. However, should have been able to paraphrase what each article meant. That is Article 1 is about sovereignty. Article 2 is about land and property rights. Article 3 is about equality. As HDA said the is GDP all over again. She has a degree in spin. She got caught out. Governance wasn’t coined then, it was already in existence as far as I know. What would be the point ? I agree that a PM should be able to paraphrase it, at the very least. AOTEAROA NEW ZEALAND, NOT YOU, AND CAN NEVER BE WHILST YOU YET REMAIN BRITISH SUBJECT. AMERICA, INDIA, AND CHINA DO SO, TO DO SO. FINALLY IF YOU CANNOT FIND IT IN YOUR PERSONALITY OR SOULS TO PROPERLY RESPECT TANGATA WHENUA, STOP RIPPING US OFF, THEN GET OUT OF OUR NATION, BECAUSE YOU ARE STILL NOT WELCOME HERE. I’ve been here as long as you and have the same rights as you. Go get a life. Not on his Marae, you don’t. And nor should you. Many are among the only few places where Maori rights are generally acknowledged by Pakeha as paramount. How many Christians who clearly state that Jesus Christ is the Way, the Truth and the Life frequent the marae? Most Christians practise paganism themselves. I don’t know, but as for me that is actually a meaninglessly jargonesque mantra which is open to multiple interpretations depending on what is said about Jesus that one wants to focus on in whichever one or more of the gospels one wants to, it doesn’t really matter. And if by pagansim you mean ritual sacrifice or mock cannibalism then Christians have arguably been doing that ever since the Last Supper. No, Christians don’t do that. Catholics do. – not being able or willing to call out false teaching. – the practise of magic arts eg crystal healing and all sorts of superstition. – the trendy ‘mindfulness technique’. – ecumenicalism (joining/agreeing with Catholicism). Perhaps that should be ‘ecumenism’. I’m quite an ignorant person Gezza. I’m just enjoying free speech. I wish I was a scholar. We need Christian scholars like never before. And I forgot the Freemasons. Ugly. Deceit. This is the main problem with the CoE and the PCANZ. And the police! And in the context of my comments today – paganism includes the spiritual meaning in Maori carvings, belief in various gods, and mana. Of course human pride in general is paganism. When Pakeha refuse to come down on their pride, it makes them ho hum about ‘obvious’ Maori pagan practises (even in church fellowships). It has become a vicious cycle. Well, you are extending the usual definition of paganism beyond what is ordinarily accepted to mean to fit your own personal interpretation or feelngs, and you are doing the same with your definition of Christian, without really ever clarifying what in your view a Christian is by how they should behave, (statements such as accepting Jesus as your Saviour [from what?] and others having false Gods [I mean no disrespect but I think yours is most likely false too – the empirical evidence for it is extremely poor, which is nuts when you think how self-important it is] I think these kinds of discussions will inevitably always get circular & just peter out. Conversations like this get circular when searching people take an interest in the first place. I think that every individual searches till their dying breath. I know that God through Jesus Christ is patient and kind and that all other religious roads only get more onerous. Look at vegans for example. They often experience a kind of euphoria in the beginning of their fast, but they inevitability run out of nutrients and minerals. I am a sinner. I need a Saviour. I made my choice to follow Jesus. He’s the Good Shepherd. I listen to Him. There’s my behaviour spelt out for you. Well, have you sold all that you own & given the money to the poor, for example? Jesus gave that advice to one young rich man. I’m glad I was never a rich man whom might not have passed that test, as the one talking to Jesus didn’t. You look for answers to life’s questions in a thread which is supposed to be about dear Jacinda’s lessons. Just let it peter out Gezza. I just typed quite a long response to that & then I realised that your very last sentence was actually excellent advice, so I’m taking it. I don’t invite myself into his house and family and he doesn’t invite himself into mine. All of us have our private spaces but only some of us try to make that into a competition for status. Apparently you do. I think the point I was trying to make has gone right over your head so I’ve made it badly, but knowing your views on this kind of issue I think I’ll just let it go as your ideas are too fixed. I think your point evaporates on any close examination. In your mind any comment I made to explain further also would, on auto-reject, hence my remark. I don’t auto-reject anything but I do scrutinise carefully. You have avowed libertarian paradigm with an immovable belief in the free market, individual responsibility and individual property rights as the solution to most of socities problems & a refusal to accept any alternative view of the effect of the treaty than your own. You don’t so much scrutinise issues involving the Treaty & Maori as simply run through that filter & outright reject any notions that clash with them. I think you are the one with an auto-reject. I thought you needed a mirror. Well you sure don’t need a projector. Dear Mr Ransfield, I am a descendant of the colonists and I do not hold our indigenous peoples in contempt. I love you actually, and hope you can love me. Whatever has hurt you, and continues to hurt, is serious indeed. I take it seriously. Our way of life is hurting many of us. Thank you for joining in on YourNZ. I hope you can find the strength to continue – as Mr Z says – bat hard. I’m listening and I am sure there are others. AW, you are way down in my estimation. If you want to be heroic, why don’t you help me? You know my testimony. You know that our way of life hurt me terribly too. You were a gentleman (without understanding) toward me! Why is your first reaction to an angry man (again, without your understanding) so ungentlemanly? Mr Ransfield is certain to have pertinent points to make on YourNZ. Are you like Maureen, whom I had to tell off? Is YourNZ YourClub? I think that you should try getting a life. I doubt you would behave that silly way if this conversation happened in a room together. I think you might walk out. I think that Mr Ransfield (which of the 9 canoes did the Ransfields arrive on?) is trotting out generalisations without really thinking about their meanings or veracity, and there’s no point in trying to make someone like that see reason. There’s no way of knowing so without face to face conversation. When I first arrived on YourNZ (traumatised) I seemed, to some people, like a person who could not be reasoned with. I would like Mr Ransfield to give us a go. I think he will be able to reason. Mr Ransfield feels strongly about some things. That’s good. Well said Mother! …. Bat away old girl!!! Miss Kitty … straight into Reducto in Absurdum eh? Mr Ransfield is speaking as a contemporary Maori … He can’t speak to you from back in 1840! Sure he’s making generalizations … Generalizations have their place. He probably saves the finer details for Treaty Settlement negotiations? And Pakeha are speaking to him as contemporary native born New Zealanders of typcally mixed ancestry many now going back five or more generations ourselves. To tell any of us to go leave our land of birth the history of which we have no current responsibility for is as absurd as me telling him your ancestors came from somewhere else too & if you don’t like it the way it is here any more you can always move somewhere else too. No Gezza, it’s not the same – because Maori are spiritually linked to the land and their ancestors. If I believed in that (paganism) I would not be able to follow Christ. I don’t believe in superstition nor ghosts. It’s different for Maori. And they don’t know Christianity. They need to lay down their mana. Parti, you commented about the goodwill shown by people at Waitangi. Human goodwill is good, but it’s not going to be enough. Mother you forget that so are many Pakeha spiritually linked to the land and their ancestors. Claiming greater rights through ancestral links is understandable from a Maori perpective is something I can understand, but also not recognising mythology & ancestry as determining one’s rights to be greater or paramount over others for whom this is also their native land, when they now predominate in numbers is also something I can understand. It is the history of millenia of civilisations. Gezza, if Pakeha truly were deeply spiritually linked to their ancestors and their land, they wouldn’t have fumbled their initial decisions. They would have understood how it was for Maori. The Maori worship false gods (hence the seemingly unsurmountable mystery of Maori mana and tangata whenua). The colonists failed to listen to the one true God. Pakeha need to front up. They need to decide whether they can bear the consequences if they let these issues slide. Sadly, it seems many are still practising selfishness, greed, hypocrisy, impatience. They are stuck because they don’t think about the children’s future. I think the government should get the treaty negotiations stitched up, then leave the rest (social aspects) to the people. Personally, I’d love to go toharoa gathering, and a few other things. Please continue Mr Ransfield. There are some intelligent minds which have let slip that they are also emotional beings (and spiritual too). Did you really mean that the pakeha are not welcome here? What specifically made you angry? All? Wherever the genuine feelings come from and how real and true the expressions of those are, arrant nonsense is still arrant nonsense. I don’t exist to please you, Mother, and I call it as I see it. Mr Ransfield is welcome to contribute here but when he makes silly generalisations he will get called on them. He may have pertinent comments to make but if so he should start making them. Attempts to pull rank won’t help him do that. You don’t exist to please me Alan? Where did that come from? That’s a strange comment. I can’t see anything re ‘pulling rank’ with Mr Ransfield. He was ranting. Do you always react with force and reciprocated anger when someone is having a rant? Perhaps Mr Ransfield is a troll. Who knows. If he’s genuine, I hope he formulates his ideas coherently and shares them. I don’t see his initial outburst as a problem, and definitely not pulling rank. I notice he has a history of being banned from several talkback radio programs. He spent most of his rant claiming to be tangata whenua. He isn’t. I’ve been born and lived here longer than he has. Seven generations ago some of his ancestors were but that time is long gone. As for his nonsense about Maori being held in contempt I am just back from celebrating a very old friend’s birthday with 2 pakeha, 2 Maori and one SAfa. None of us holds anyone in contempt on account of their race and our families cross racial differences. I fear the guy is an idiot. Not an idiot. Someone with ideas and a hurting past. But thank you for the background info Alan. He’s got a hurting present. Straightening out his thinking is the only cure. A man’s formative years for thinking are influenced by our education system, through the generations. Jacinda should make sure we all understand the treaty and we need a major overhaul of our school curriculums. You could surgically remove his British portion so he is not so conflicted.